As the clocks go back and the morning frosts return, many of us turn our attention to next season and start drawing up plans for our 2019 running adventures. While there are adventures aplenty here in the UK, many are drawn to the larger ranges, with the European Alps a natural destination for those looking for bigger challenges and, the potential for, warmer weather. Within ultra running races such as The Ultra Tour du Mont Blanc (UTMB) are the dream of many and it certainly topped my bucket list for a few years. You don’t, however, have to commit to big races to get your taste of alpine adventures. With cheap flights and services such as Airbnb, trips from the UK are more affordable than ever and long weekends are equally doable with careful planning. The Internet is a wonderful resource and browsing Amazon you will find many guidebooks on the subject, with Cicerone one of the most popular, with many different guides covering a range of activities and regions of the Alps and other popular destinations or routes across Europe. Cicerone has been kind enough to share with me two of their latest guidebooks, both of which could be helpful for those looking to explore popular regions of the Alps next year. The first is Trail Running in Chamonix and Mont Blanc Region, by Kingsley Jones, who some of you may remember wrote the excellent Trail Running in the Lake District guide I reviewed last year. The format of this guidebook follows the traditional and well proven Cicerone format, starting with some background to the region, and information that will make your trip easier, such as travel and accommodation. As an International Mountain Leader, Kingsley is well qualified to talk about safety in the mountains and his section on mountain running, in particular, is an informative read for those that have not ventured into the high Alps before. He covers most areas that readers would have questions about, ranging from kit selection to running with both poles and at altitude, navigation and even recommendations on acclimatisation to the altitude. 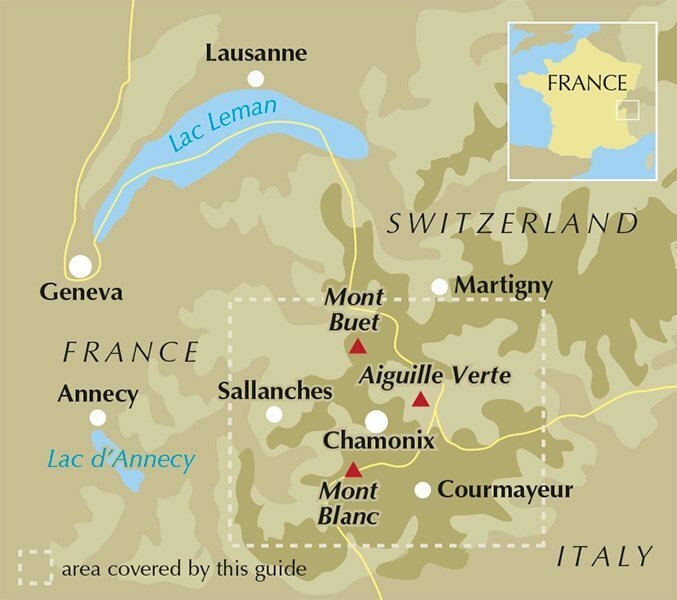 The book then shifts to focus on routes in and around Chamonix, forty in total, grouped around various starting locations so you can plan your accommodation accordingly. There are some real crackers here, that will suit everybody tastes. From short woodland loops in the valley floor to higher routes taking advantage of uplifts. The inclusion of the Chamonix VK (Vertical kilometre) and Marathon du Mont Blanc routes are great additions, as is detailed coverage of all the races that make up UTMB week at the end of each summer, a really useful read for any planning to run those races or reccy the courses. Each route is graded, using a 1-5 scale, allowing those unfamiliar with the terrain to understand what they are letting themselves in for and plan their kit or route choice accordingly. Where there are specific areas of difficulty, these are even highlighted within the grading, which is a nice touch. For instance, the Marathon du Mont Blanc route is described as Level 2 (2km of level 3 over Posettes). As expected, there is a detailed description of every route, along with nice clear maps and route profiles highlighting the key climbs. The maps are at 1:100,000 scale which in some cases may be sufficient but in many, especially those in the higher mountains, you may want to consider taking a larger scale map with you. Finally, a really useful list of website addresses and contact numbers at the end of the guide will help those looking to find out more about the region and plan their trip. 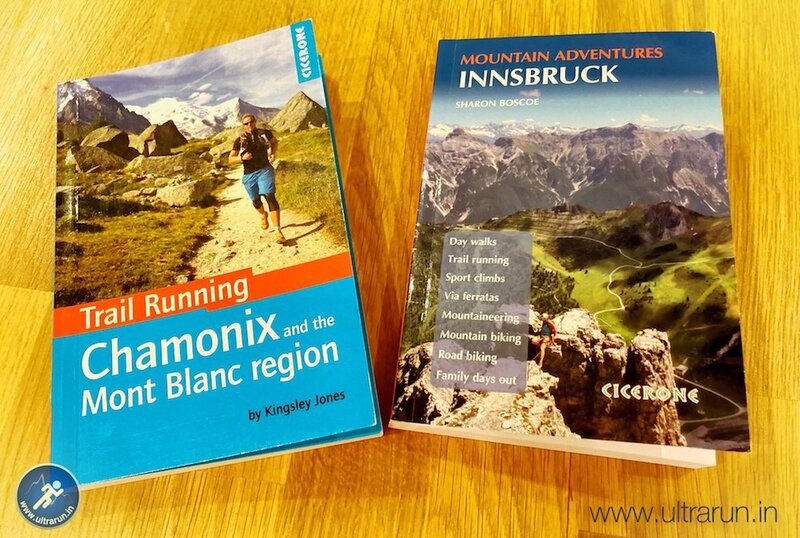 Put simply this guide is brilliant and a useful addition to any runners library but especially those planning their first trip to Chamonix. The photos are really inspiring and if you’re looking for a guidebook to help fuel your plans for 2019, you won’t regret checking out a copy of Trail Running in Chamonix and Mont Blanc Region. The second book is slightly different, in that it takes a broader view than just running of a specific region of the Alps. 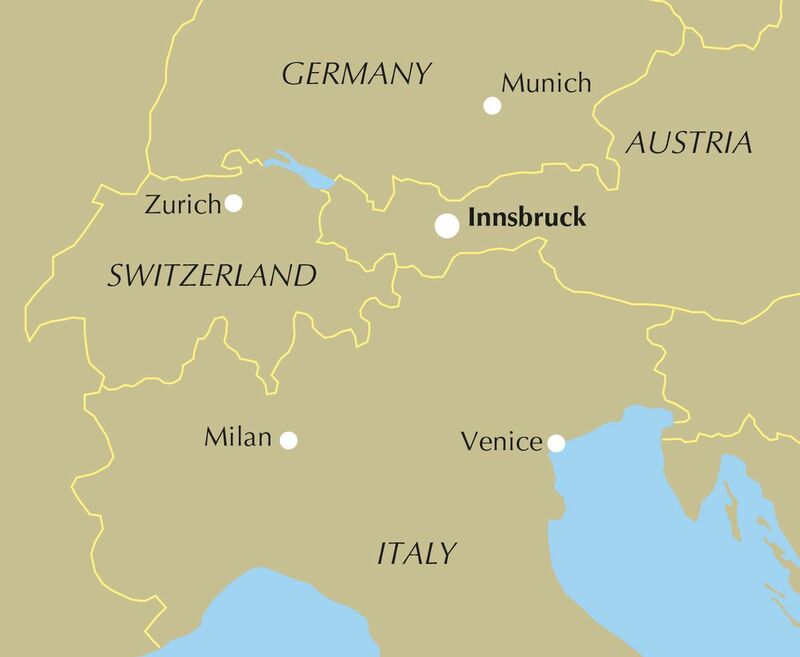 It is Innsbruck Mountain Adventures: Summer routes for a multi-activity holiday around the capital of Austria’s Tirol. 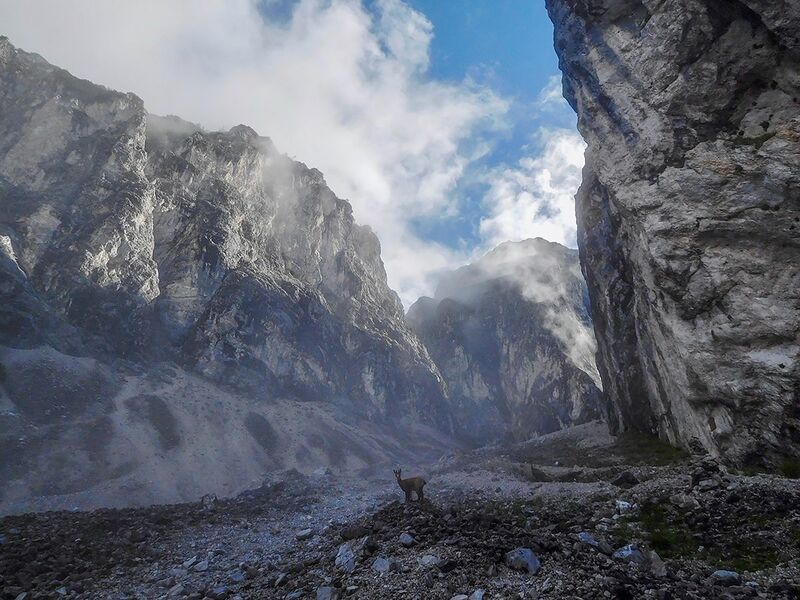 Written by Sharon Boscoe, a Brit and now a resident of Innsbruck, this guide aims to give you a flavour of a variety of mountain based activities, that you may wish to do while staying in and around Innsbruck. From walking to climbing, from cycling (road and mountain) to via Ferrara, from trail running to fun family days out, this guidebook covers it all. As with all Cicerone guidebooks, Sharon starts by providing a good introduction to the region, including not just the usual advice on travel and accommodation but also the flora and fauna, geology and local art and culture. The focus of the book, however, is on the range of activities, with sixty routes to choose from. These are broken down into their various activities, so you can easily check-out what is on offer if, for example, you are travelling with children or road cycling is the main aim of your trip. There are a good range and variety to choose from, based upon your aspirations and skill sets. Taking walking as an example, there are easy family friendly valley walks, more stretching mountain/adventure walks, scrambles and even overnight hut based adventures. What I loved is that the majority of routes are accessible using public transport, with details provided for each where applicable. As you would expect, there are easy to follow route descriptions, great photos and lovely clear maps, although as with the previous guide, you may want to consider a larger scale map for some of the routes. Each route also includes a profile, so you can get a feel for the climbs on the route and manage expectations, a great addition if you are looking to keep your children entertained and engaged during these mountain adventures. From a running perspective, there are just five specific routes highlighted, covering a blend of street and trail running. Of course, for the more adventurous, the walking routes can also be easily be adapted for running, with twenty of these included, so there is plenty of inspiration. Finally, the inclusion of ideas for rainy day activities and information about local festivals is a welcome addition, as is the glossary of terms and some key local phrase at the end of the book. The detailed appendix with contact information for local restaurants and mountain huts is also a welcome addition. How well these lists stand the test of time it’s difficult to say, although as with all their guidebooks, Cicerone provides a useful online resource through which updates can be shared, ensuring you can have the latest information in the years to come. If you are looking for more from your alpine trip than just running adventures, you are taking your family and are looking for activities you can share together or you are just looking to explore a new area, Innsbruck Mountain Adventures: Summer routes for multi-activity holiday around the capital of Austria’s Tirol, is well worth a read and I for one will be looking to include this in my plans in the years to come.